MV ... I first saw you in our classroom. You were late and I was little miss proper and overachiever. You asked to sit beside me and I gave you a scathing glare and said, "Do I own the chair? Is my name written on it" and turned the other way around. Little did I know that you would have such a big impact on my life and that to this day, your mark remains. You were my first kiss and my first major heartbreak ... to be honest, the biggest heartbreak of them all. JM ... we met because of your friend. He used your phone to text me and we became text mates. Eventually we found out that we studied in the same university and that your building faces mine. We met and I remember you pacing back and forth and me thinking, who is this dweeb? You turned, smiled, and said "Kay?" Little did I know that you would be in my life for almost two years and you would be the first guy to come in between a friend and I. Little did I know that you would be one of the biggest betrayals in my life. ES ... You sent me a very impressive private message at an online forum and taught me to use complete words when sending SMS. We met and you looked like royalty while I looked like a slave since I just came from shooting for my project. You handed me a balloon with a pig inside. I was mesmerized. Little did I know that I would soon be that pig inside the balloon ... nice to look at but all deflated inside. Little did I know that you would make me lose my belief in myself with your verbal harassments. RS ... I was wearing midriffs showing off my uber flat tummy and skin tight jeans while sporting killer red heels and hoop earrings that could be used as a bracelet. I looked like the model that I was and you ... you looked like a farmer with your loose jeans, slippers (yes, slippers OMG) and over sized FBI shirt. I was thinking, WTF and you were simply amazed that DLSU students apparently do dress up. It wasn't love at first sight. Little did I know that you would be the one that got away. RA .... 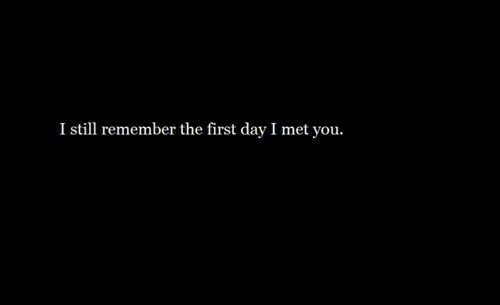 I met you at work and I couldn't remember your name even after 5 introductions. You were "myseterious" and insignificant but you made your presence known to me. I wish that you had remained a mysetery. Little did I know that you would be my biggest nightmare. JB ... I met you at Starbucks. I purposely didn't dress up in the hopes of deterring you and making you lose interest in me. Epic fail. The first thing you said to me was "Wow! You are gorgeous." Little did I know that you'd turn this gorgeous thing into a nervous wreck in just 17 months. 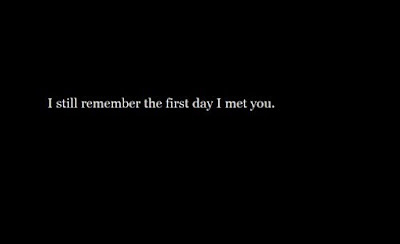 I still remember the first day I met you all. More important, I remember the lessons I learned from being with you as well. Pareho talaga tayo. Been reading your posts and I must say that we are the same in some ways when it comes to relationships. Reliving them in our minds and finding life lessons here and there. :) Katuwa! Ako din, I remember the 1st time Ive met the guys that I got involved with.